While only 1 hour away by Jetfoil from Hakata Port of the busy Fukuoka City, Iki Island is surrounded by the emerald green ocean like Okinawa is, and offers exquisite views of the nature and many gourmet meals full of high-quality foods such as sea urchin, abalone and Iki Beef, all of which make this heavenly island an attractive destination filled with hidden gems and specialties. Nishikihama Beach is known as the mecca of marine sports among numerous beaches in Iki, and boasts outstanding ocean water transparency. 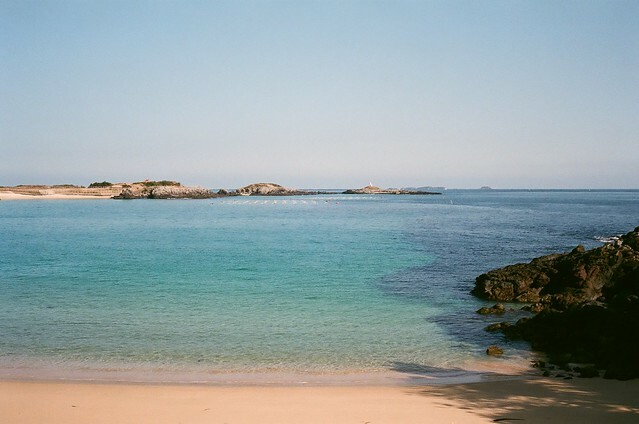 The beach sand is very granule, and the contrast of the blue color of the ocean, white color of the beach and green color of pine trees is breathtaking and definitely worth a look. A diving shop which also serves as a cafe-bar is available, and the taste of a cocktail while listening to the sound of the waves is exquisite, let alone unforgettable. Tsutsukihama Beach is Iki’s premier beach and is one of Japan’s 100 best beaches selected by the Ministry of the Environment. 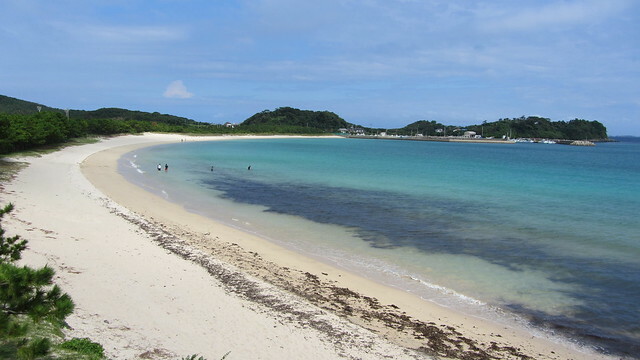 The fine white sand beach of 600m length that continues into the shallow ocean water and calm waves make Tsutsukihama Beach a popular summer destination for many visitors. The nearby Tsutsukihama Fureai Park houses various facilities such as campgrounds, barbecue space and tennis courts, and contributes to the popularity of Tsutsukihama Beach as a summer getaway place. 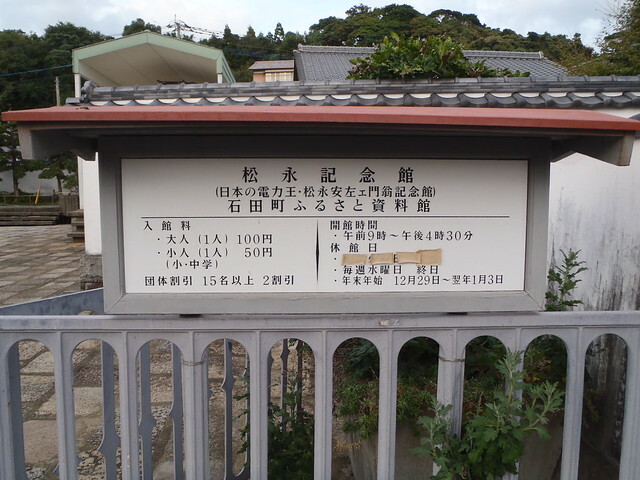 The uninhabited island “Tatsunoshima” is only about 5 minutes by ship from Katsumoto Port in the northern end of Iki. Cruise ships operate from March through October, making this island accessible for anyone. It’s a popular sightseeing spot with cliff walls made by many years of rough waves eroding them, such as Jagatani, and transparent sea water of the emerald green color, as well as the nearby palace under the sea, mammoth rocks, and seta rocks. 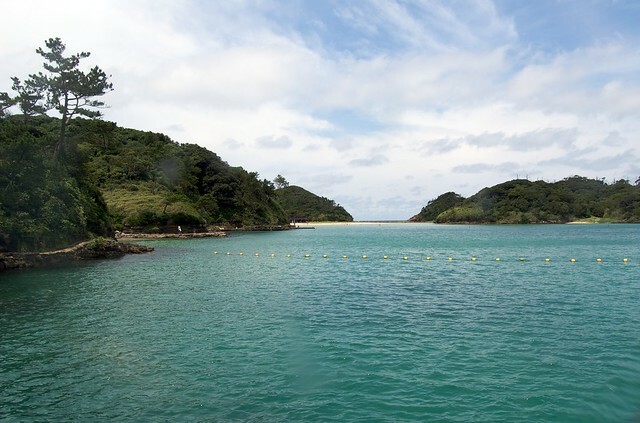 Iki Dolphins Park located in Katsumoto Town at the northern tip of Iki Island is a seaside park built with natural coves. Visitors are welcome to spend time with adorable common bottlenose dolphins. There are various playground equipment as well, making this a popular spot for children. The «Dolphin’s Meal Time» program offers a chance to get first-hand knowledge on dolphins and observe how dolphins are trained. The history of Iki Island is old, and in the Chinese history book about Japan «Records of the Three Kingdoms: Record of Gishi Wajin-den» written in the third century, Iki Island is referred to as «Ikikoku». During the Nara period (710 – 794), Iki was recognized as one independent country of «Ikikoku (country of Iki)», and Kokubunji and Ankokuji temples that existed in each country at that time were also built here. Sailing expeditions and envoys came to Japan through this island, passing on the continental culture from China through Tsushima and Iki. As can be seen, in those times Iki was already an established bridge between Japan and the continental China. In the Kamakura period (1185 – 1333), the attack by the Mongolian army, which was known to be the strongest in the world then, gave devastating blows to Iki twice, and even today we can see many remnants of this era on the island. Iki is a unique and valuable place where one can witness and experience Japan during its ancient times through medieval years. On Iki Island, which was called “Ikikoku” in the Chinese history book about Japan «Records of the Three Kingdoms: Record of Gishi Wajin-den», there are a total of 482 historical remains including 279 ancient tombs, and in its entirety serves as a history museum. Ikikoku Museum not only presents excavated items, but also serves as the bridge between historic sites and tourist spots of this island. 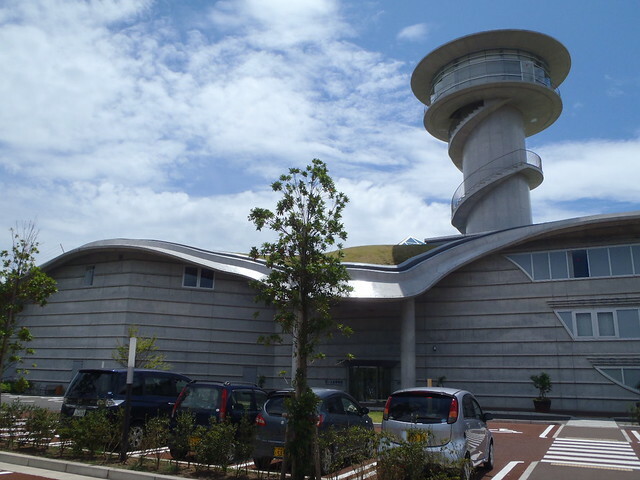 The museum was designed by architect Kisho Kurokawa, and features a curved design and a roof made of natural turf. The museum is located in the northeast of «Haru-no-Tsuji Ruins», a special historic site designated by the Government of Japan, and it is recommended to visit these two together. The observation room on the 4th floor commands a view of Iki Island, and from the observation deck on the lawn on the 3rd floor opens a view of «Haru-no-Tsuji Ruins». 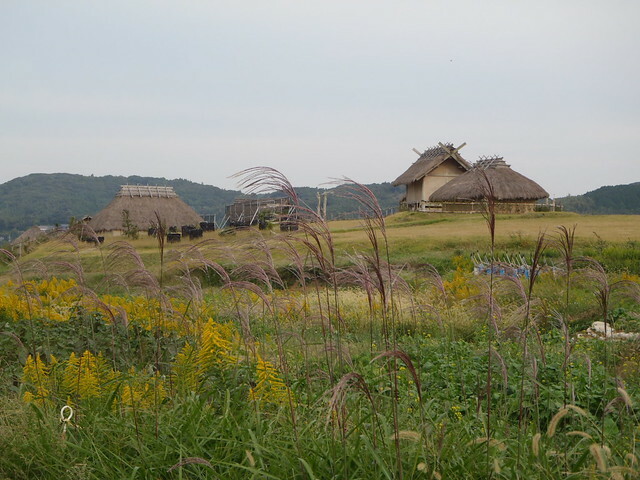 «Haru-no-Tsuji Ruins» is a ditched settlement of the Yayoi period (tenth century B.D. – third century A.D.) and was identified as the kingdom of «Ikikoku» in the Chinese history book about Japan «Records of the Three Kingdoms: Record of Gishi Wajin-den». «Haru-no-Tsuji Ruins». It is a special historic site designated by the Government of Japan, equivalent to a national treasure of historic ruins, and is maintained as the Iki Historical Park’s «Hara-no-Tsuji Ikikoku Kingdom Restoration Park». Inside the park are 4 zones: The «central area zone» with restored buildings and remains from excavation surveys; The «ditch zone» with multiple reproduced hill-surrounding ditches; The «botanical zone» where plants grown by people of the Yayoi period are grown; The «outdoor experience & remains exhibition zone» exhibiting potted pottery remains in the exact state they were found. Excavation methods, etc., are exhibited in «Hara-no-Tsuji Guidance” located in the northern side of the park, where restoration and maintenance work are explained in video. Various popular hands-on workshops are also available, such as magatama (curved jewels)-making, potted pottery making, glass ball making, and fire-making. Yahata-ura in the eastern part of Iki Island is well known for fishing of sea urchin and other seafood by «ama» divers (woman divers). «Harahoge Jizo», situated along the seashore of Yahata-ura, are six ocean «jizo» (stone statues of bodhisattva) who save humans from 6 realms of rebirth and existence: Gods, demigods, humans, animals, hungry ghosts and hells. At low tide we can approach them and pay our respects to them up and close, but at spring tide the statues completely submerge under water. The statues have round holes in their chests so that offerings to them do not get washed away at spring tide, and for this reason they are called «Harahoge Jizo». The origin of «Harahoge Jizo» is unknown, but it is said that locals pray to them to bring peaceful rest to the souls of «ama» divers who perished into the ocean and whales that were captured around Iki, and to repel and cure illnesses. 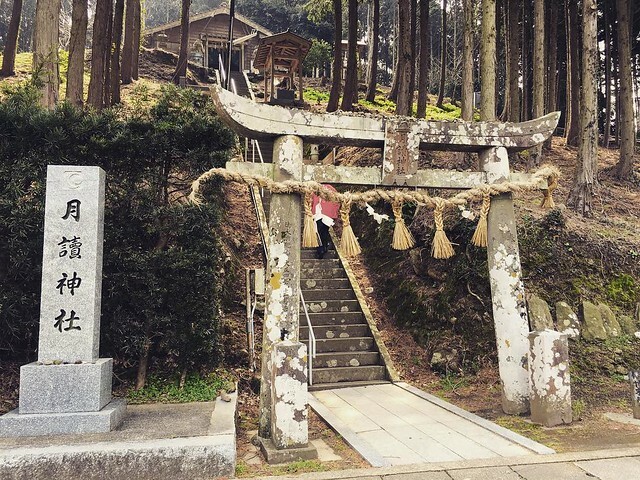 There are 150 shrines registered by Jinja Honcho (Association of Shinto Shrines) in Iki and there have been many shrines here since the ancient days to the extent that Iki is said to be the place of origin of Shintoism. At Kojima Shrine, its entire island is regarded as holy to the extent that it is prohibited to take home even twigs there. At low tide, the sea cracks and the entrance path to the shrine appears, while at high tide the path submerges under water and the shrine looks like an isolated island. Due to this mysterious and yet curious phenomenon, Kojima Shrine is also called «Mont Saint-Michel and its Bay of Japan» and attracts many tourists. Visitors can also find unique sights of underwater creatures that can swim at high tide when the entrance path submerges, but fail to escape when the tide becomes low. Tsukiyomi Shrine, which stands as though hiding behind thick trees, enshrines three pillars dedicated to a Shinto god Tsukuyomi-no-Mikoto. It is told that in year 487 a part of this god’s spirit took residence at Tsukiyomi Shrine in Kyoto, an auxiliary shrine of Matsuo Taisho Shrine of Kyoto, and that this led to Shintoism spreading throughout Japan. From the torii (a traditional Japanese gate commonly found at the entrance of or within a Shinto shrine, symbolically marking the transition from the mundane to sacred) facing the prefectural road, the entrance path with steep stone steps continues through a cypress woodland. Even in daytime it’s shaded and thus dark, creating a mysterious atmosphere. For its reputation of being the place of origin of Shintoism, Tsukiyomi Shrine is frequently featured by mass media. 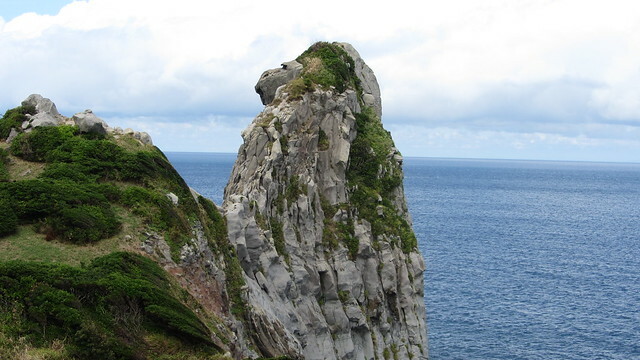 Saruiwa is a 45m-high basaltic rock on a sea cliff at the very tip of Kurosaki Peninsula protruding west of Yunomoto Bay, a hot spring resort of Iki. Saruiwa (directly translates to «monkey rock») looks just like a monkey that turned away, and it is mesmerizing to observe this miraculous creation of the nature and ponder how it came about. Saruiwa is also known as one of the eight pillars in the Japanese mythology on Iki Island creation. This memorial hall was built at the birthplace of Yasuzaemon Matsunaga to commemorate his achievements in promotion and development of the electric power in Japan during the Meiji, Taisho, and Showa periods and his contributions in founding industrial and economic developments of Japan. The hall exhibits items that he cherished and used, as well as letters he received from Shinpei Goto (Japanese politician and cabinet minister of the Taisho and early Showa periods), and Tsuyoshi Inukai (Japanese Prime Minister in 1931 – 3921). The adjacent Furusato Museum displays various materials on folklore. Visitors will find the life of Matsunaga, who was also a reputable master of the tea ceremony of the Showa period, truly impressive. Also in the peaceful cobblestone garden, a railway train of Fukuoka City Electric Train that Matsunaga established in 1849 stands prominently. Iki is the birthplace of Mugi Shochu, with a 500-year history. In ancient Iki, rice cultivation was popular, which contributed to the development of sake production, thanks to abundant grain and high-quality groundwater for ingredients, and many farmers produced «doburoku (homemade sake)». Distillation technology came to Iki from the continental China between the Muromachi and Azuchi-Momoyama periods (1336 – 1603). During the Edo period (1603 – 1867), Iki islanders ate wheat mostly as their staple food rather than rice (rice is traditionally the staple food of Japan) due to heavy taxation under the ruling of the Hirado Domain. Homemade Shochu made by distilling leftover wheat and combining it with rice malt became the origin of Iki Mugi Shochu. The pride of the islanders being Japanese shows in their application of rice malt, which is traditionally used in Japanese sake-making. In July 1995, the tradition and production method of Mugi Shochu were given protection under World Trade Organization (WTO) regulations as a “geographical indication”. Iki Shochu, which is now a world-renowned alcohol beverage designated with Geographical Indication, is produced by the island’s 7 distilleries according to its tradition and production method.